I wrote last week about my recent, secret mission to Hanoi, where I hunkered down and pounded away on the rough draft of my forthcoming book, The Ghosts of Bùi Viện Street. I went to Hanoi to work on my book about Saigon because I needed to get away from my daily routine and be in complete control of my writing schedule. I wrote like crazy … but I also go a little crazy if I don’t socialize. I was thrilled to discover Hanoi has a thriving creative community. I was invited one night to a party where everyone had to share something creative they were working on. It could be anything. Some people shared photos or videos. Some read poems. Some talked about charitable projects they were starting and asked for advice to help make them successful. One guy sang a song. Many of the people there were experienced travelers, so I decided to read a brief excerpt from the first chapter of my rough draft about the anxiety we feel when arriving late at night in a foreign city. This particular blurb is more of a general musing on travel than a close-up of Bùi Viện Street but it resonated with the group. Traveler’s paranoia when we first arrive in a new place is something many of us experience. As I rode to the party on my rented motorbike, it dawned on me: I’ve been working on this book for three years – and I hadn’t shared a word of it with anyone. And if I was going to share something in a room full of strangers, I thought, I owe it to my faithful website visitors to give them the same verbal snack. So here it is: The five paragraphs I shared at this party. (We had to be brief as there were lots of people there.) I’ve still got lots of writing to do, but this one-month retreat gave my manuscript the resuscitation it was needing. 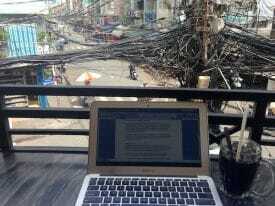 View of Bùi Viện Street from one of my many makeshift offices. Arriving after midnight in a foreign city always makes me jittery. After midnight is when the balance shifts, when the seedier elements of society multiply. Con-artists, like cockroaches, do their best scavenging after midnight. The wee-hour murk gives them cover. Fused with the darkness is a fatigue, which hangs over the city like a weighty cloud. That fatigue makes tourists extra vulnerable. Big cities offer menus of late-night scams. Late at night, tourists are tired, tourists are tipsy, tourists are lost. Maps drawn in daylight hours malfunction after dark. The streets don’t look like they did before sunset. Disorientation happens quickly. Some people grow weak to hormonal urges, blinded by a fantasy that the lusty stranger who has appeared out of nowhere to profess her or his love means them no harm. And travelers who are not impaired by any of these things are still more vulnerable due to a simple numbers game. No matter how alert, sober, oriented, and non-horny one might be, it doesn’t change the fact that professional thieves are out in force, working the graveyard shift they work every night. Some of these thieves conduct their business in the heart of the city. Others lurk at airports, train stations, bus terminals, any point-of entry where the newly arrived are tired, and desperate to feel a pillow under their noggin. Taxi drivers are notorious. Their meters tick extra fast, or not at all — and this can happen no matter the hour, but after midnight, when the newly arrived are anxious to squelch a phobia of homelessness, the drivers have easier odds with more complex ploys. Hotels where one has booked a room are suddenly “closed,” but the too-friendly driver knows “a better place” and insists on going there. If the new arrivals sense they’re being cheated by their cabbie, they can’t just hop out and walk. Not without their luggage, held hostage in the trunk. This was one reason I was antsy about landing after midnight in Ho Chi Minh City. Some people have called me “intrepid” — a travelers’ cliché — but while I try to hide it, the truth is I’ve always been a nervous explorer, with a hyper-sensitive radar that keeps me safe in some circumstances, but which heightens my anxiety upon arrival, sometimes to neurotic proportions, especially after dark…. Want to explore Vietnam with me? Join me on a travel writing tour and learn how to write about your journeys as we seek out adventures my adopted home country. Writers of all skill levels are welcome! Get more information here.